Next week is my youngest son, William's 10th birthday. 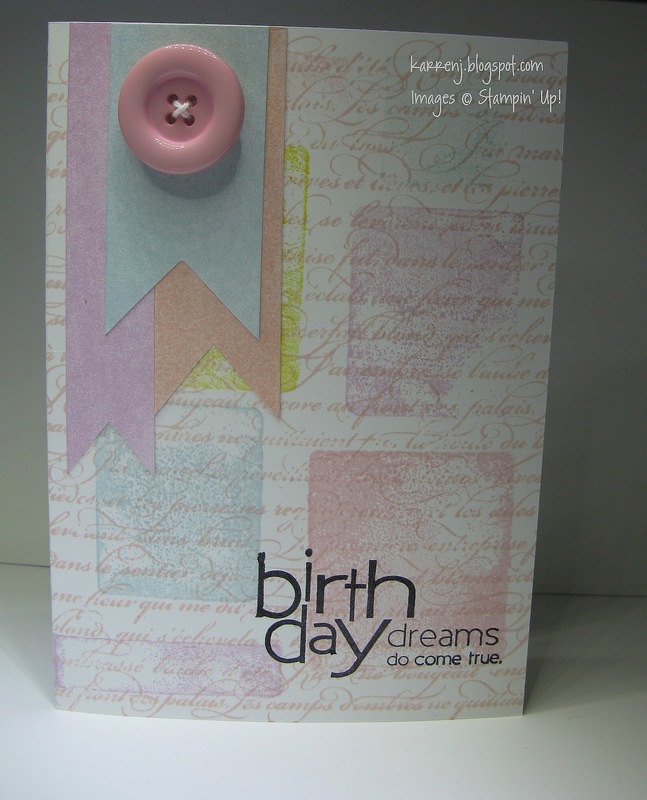 Today is my last chance to make him a birthday card. 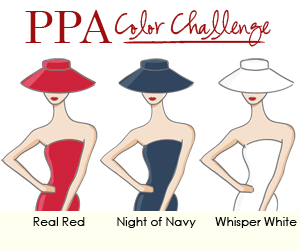 I used this week's Fall To Layout plus the color challenge from Just Add Ink. I really loved the sketch and decided to stick with the star images. 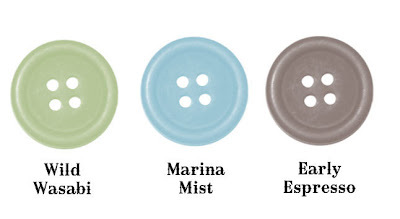 However, Marina Mist is not one of my favorite colors, so working that into the card was a bit of a challenge. Luckily, William's favorite color is green, so hopefully he'll like the card. 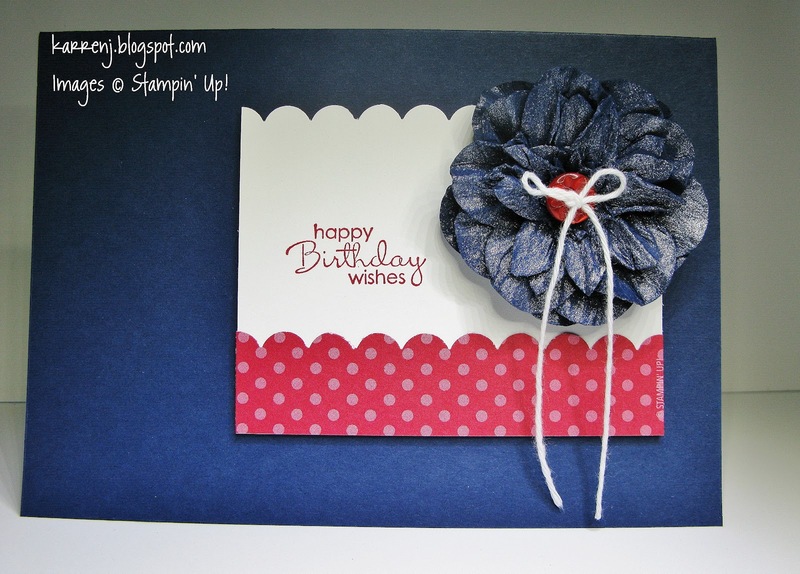 I took inspiration from Christine Blain's cool card and went for a grungy look. 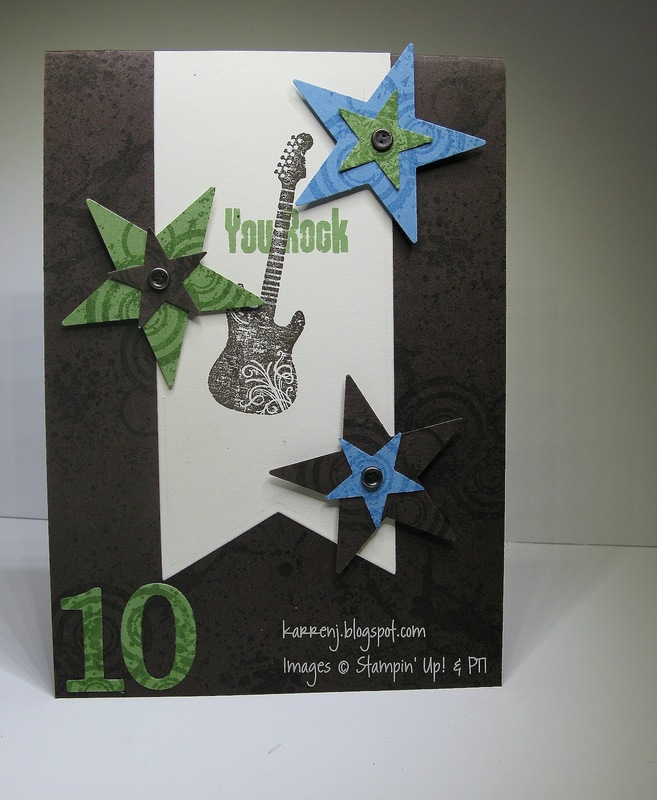 I randomly stamped images from PTI's Grunge Me set over the card base and also over the stars and the "10". The hardest part was deciding what to stamp in the Very Vanilla panel. Edited to Add: This card received an Honorable Mention at Just Add Ink this week. Thanks, guys! This is the third of three cards I've made today. The other two will be posted shortly. I made this card for two challenges - this week's Freshly Made Sketch challenge and the second challenge at Addicted to Stamps which is a Bingo challenge. In case it's not obvious from my card, I chose Stamp, Emboss, Blue. I chose to use the sketch as inspiration for a gatefold card. 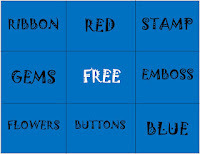 I haven't made one of these in years! 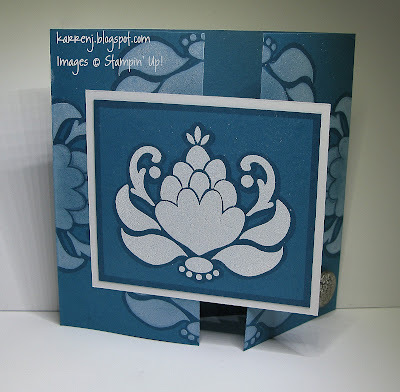 My stamp-a-majig came in very handy lining up the Ornate Blossom stamp across the center as I had to stamp each side separately to get full ink coverage. 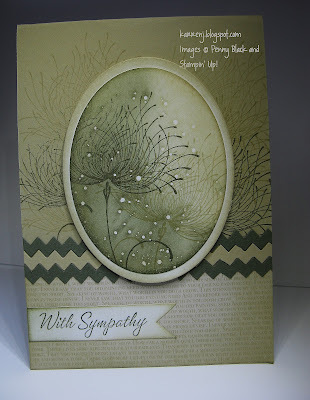 Once I'd stamped in Whisper White Craft Ink, I used the VersaShadow Technique to highlight the images. 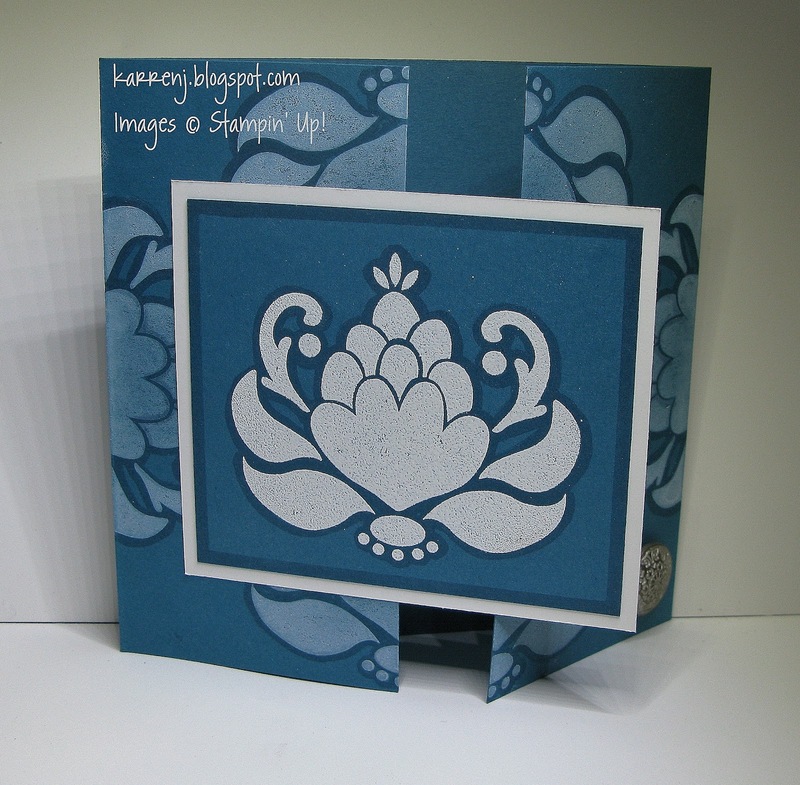 The main panel is white embossed on Island Indigo. I also used a ruler to draw a frame around the main image. An antique brad holds the card closed. I got Mixed Bunch and the co-ordinating punch in my last order and today was the first time I got to use them. Tell you what, doing color challenges has really highlighted to me how many colors I don't use! Pumpkin Pie is one of those colors, so I used the smallest amount possible LOL. I stamped the flower onto Whisper White and punched it out. 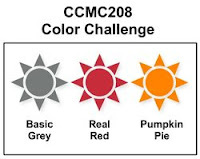 I then took a Pumpkin Pie marker and colored in the center. 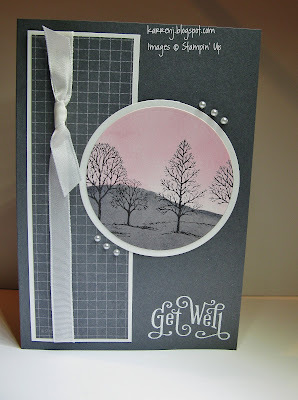 For the sentiment, I used Basic Gray and Real Red markers and my Stamp-a-majig. The end is shaped using the Modern Label Punch. As mentioned in my previous post, here is my second card for this week's Freshly Made Sketch Challenge. 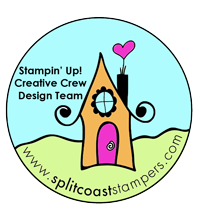 I'm also submitting this for a new challenge at Addicted to Stamps which is to use markers. I caved and got some Copic markers (DH very kindly paid for them for Mother's Day). 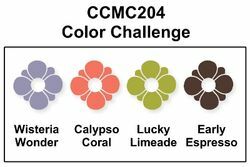 I only got 25 colors but I already need more. What have I got myself into??? LOL. Anyway, this is only the second time I've had a play with these markers, so I'm very much at the beginning of the learning curve - but man, they're fun! I went hunting for a stamp set that required coloring and found this one, which is so cute! Everytime I see these little bees, it reminds me of The Bee Movie, which I love. I dry embossed the base with a woodgrain EF and made sure to match the wood-graining on my Chocolate Chip scallops as well for continuity. I was fascinated with a recent technique posted over on SCS called Masking Fluid Resist and wanted to give it a go. 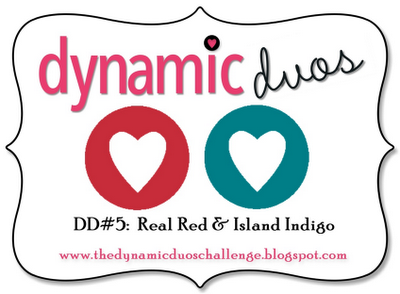 So I incorporated that into this week's Dynamic Duos color challenge and Freshly Made Sketch. 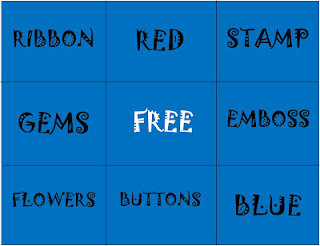 I'm not 100% sure the sponging on this card qualifies as the "clean" that is part of the FMS challenge, so I made another card using the same sketch which I'll show you in a separate post. I had some masking fluid because I'd seen Heather Telford use it on her blog before and wanted to try it for myself. If you haven't seen Heather's work, check it out. She is the master of sponging! Anyway, onto the card. 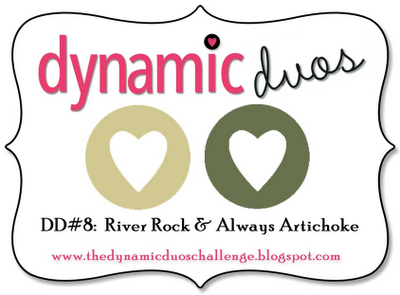 I followed the instructions for the technique, except I only used two colors - River Rock and Always Artichoke. This is a fun technique - the hardest part is waiting for the masking fluid to dry, but heat tools were invented for a reason LOL. 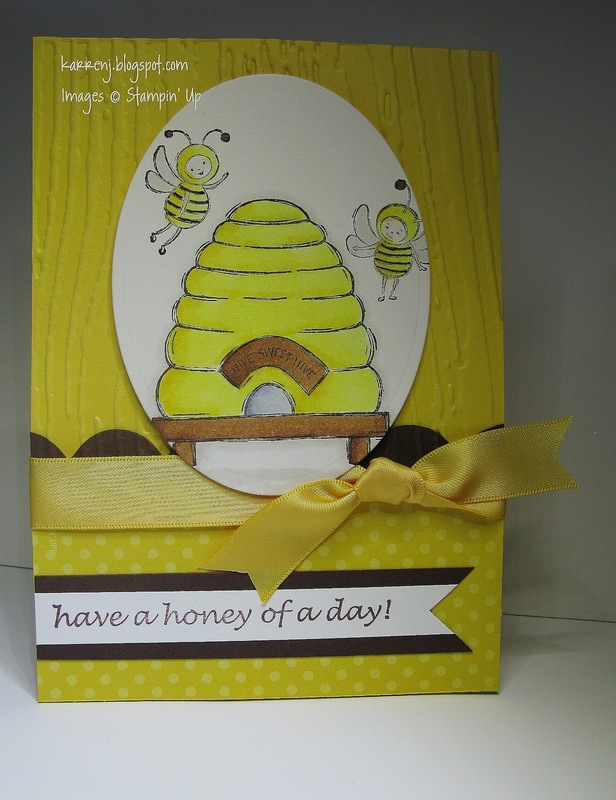 I didn't put any embellishments in the top right corner because I wanted to keep the card more muted and somber. 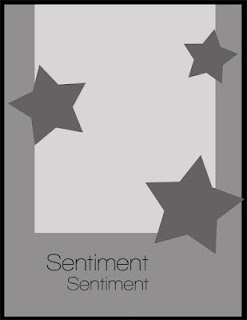 Edited to Add: This card was chosen as the top pick at Dynamic Duos. Thanks, guys! Today's card is for two challenges: Create With Connie & Mary have a color challenge and the Stamping 411 Saturday Sketch Challenge. 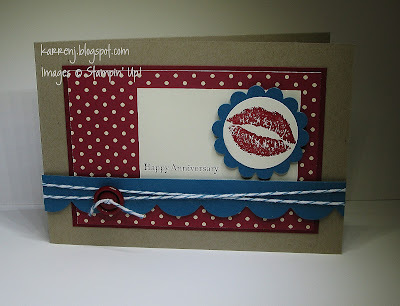 I thought the colors tended towards masculine, so I went in that direction and made an anniversary card. 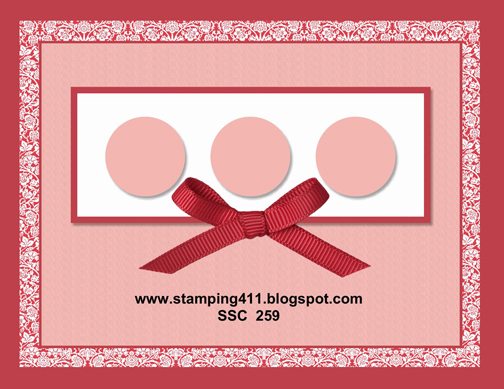 I couldn't find a way to make the strip behind the scalloped circle work, so I ended up leaving that off. 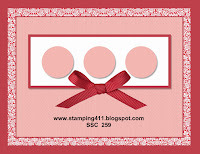 Both of the scalloped pieces are popped up on Dimensionals. 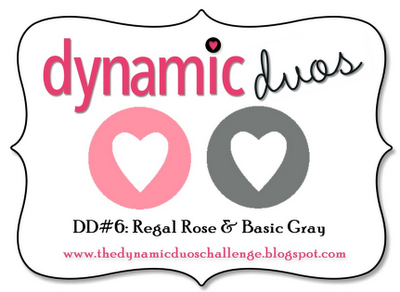 I'm scraping in under the wire with this week's Dynamic Duos color challenge! 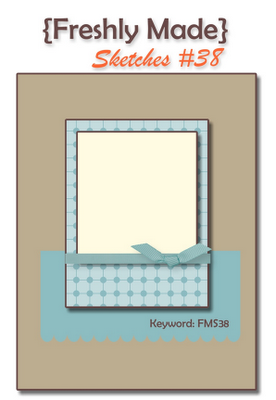 I've paired it with this week's Freshly Made Sketch challenge as well. 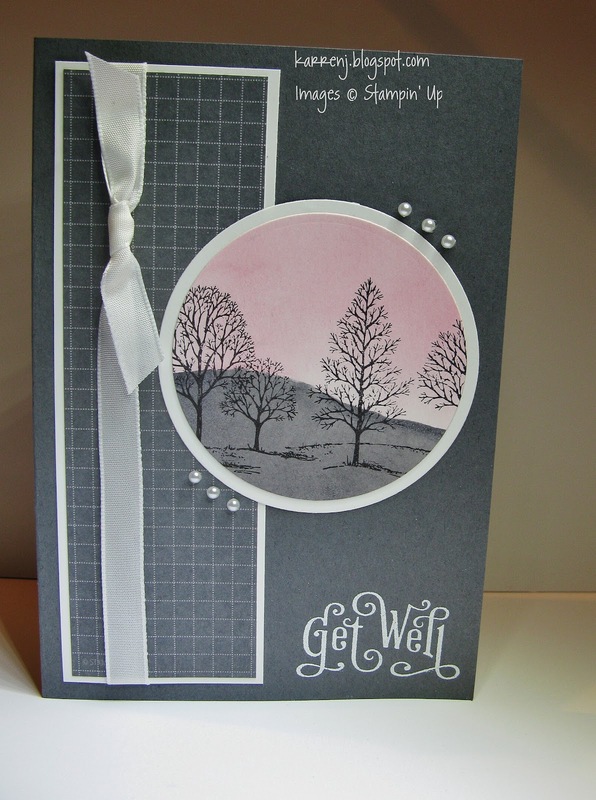 For my card, I did some very basic masking and sponging with Regal Rose and Basic Gray before stamping the trees in Basic Black. The DSP comes from a really old DSP pack, which I think was a hostess gift a few years ago. I had to take the photo under artificial lighting tonight, so apologies for the quality. 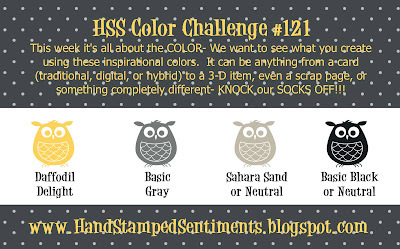 It's not often I stamp at night as I'm generally not in the mood after a day of work, but I didn't want to miss the color challenge, so needs must! 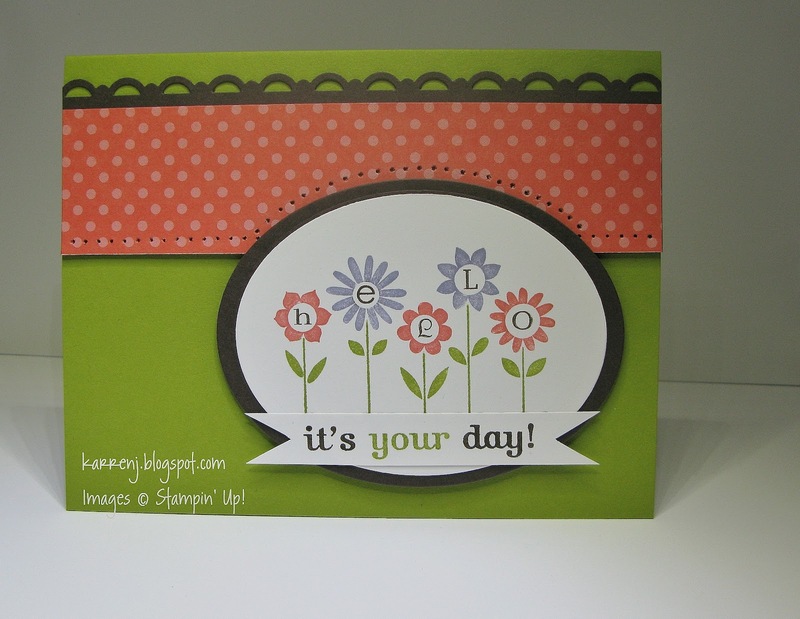 While the family was away for the afternoon visiting my mother-in-law, I managed to get another card made. 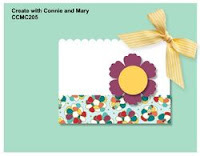 This one is for two challenges - Pals Paper Arts Color Challenge and Create With Connie & Mary who have a sketch challenge this week. I am not a fan of bright reds, so used only a tiny bit for an accent color. 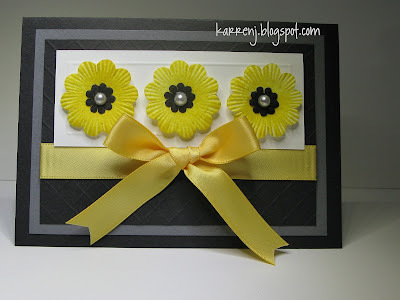 The flower was made using the Fancy Flower Punch; the 5-Petal Flower Punch and the long-retired Spring Bouquet Flower Punch that went with the Looks Like Spring set. After I put the flower together, I liberally sprayed it with Frost White Shimmer spray, heat set it to dry it quickly and then used a Real Red button for the centre. 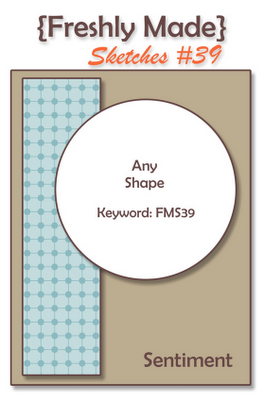 Each layer is popped up with dimensionals so it's definitely a lumpy-bumpy card not designed for the mail. The photo is a bit glare-y, sorry. As it gets more into winter here, it's harder to get a natural looking photo and all I have to help is one OTT light. 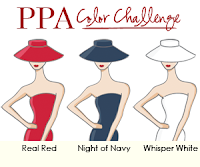 For my colors I substituted Whisper White for Sahara Sand. I sponged color onto the paper daisies and left them for a few minutes to dry before sticking them together with glue dots. A large pearl in the centre of each flower finished them off nicely. 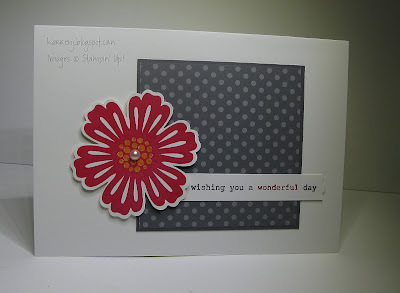 It wasn't until I was adding the watermark that I realised there was no stamping at all on this card. But there was lots of scoring! I diagonally scored the Basic Black layer and scored a frame on the Whisper White layer. I bought a Hero Arts stamp and framelit set a few months ago and thought I'd better actually use it. 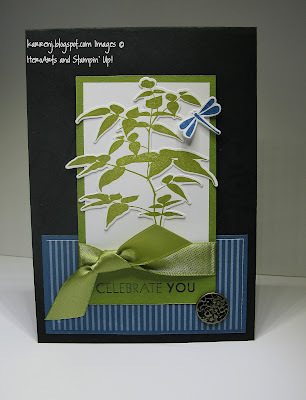 You can't see in the photo but I stamped the fern image randomly on the Basic Black card base. All day today Christchurch has been covered in snow and there doesn't seem to be any sign of it letting up. Several parts of the city also had electricity failures and unfortunately we lost electricity twice today for almost 2 hours each time. Add to that 2 boys who fought with each other all day and don't know what to do with no electricity to power their various devices and it made for a stressful day. I'm actually looking forward to being able to go back to work when this lets up. In between power failures, I did get into my craft room and tried the faux patina technique which I've been wanting to try since I first saw it on SCS. 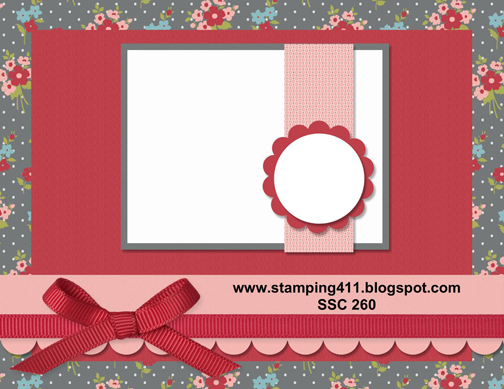 I also used the sketch from Stampin Queens but the link is closed so I can't link it up but do want to give credit. For this background I used the same ink colors as in the sample on SCS, but I did try another sample using some distress inks, which was also quite cool. I love the richness of this technique and will definitely do this again. I don't like the size gaps between the framelits, so I took the same framelit as the espresso layer and traced around the outside with a pencil, then cut it out by hand. It's not as defined as using a framelit, but I like the layering better. 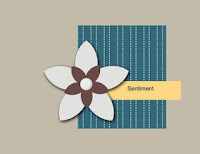 Accessories: Gold EP; Labels Framelits; Vintage Wallpaper EF; Early Espresso ribbon. I took inspiration from both the boxes and the colours. I started with a blank Whisper White card base which I semi-randomly stamped by inking up various acrylic blocks with ink. On top of that, I stamped En Francais background in Tattered Rose Distress Ink - love that colour! My youngest, William, will be 10 next month and he's been nagging me for ages to make his birthday party invitations. So here's the prototype - for which I used the colours of this week's Dynamic Duos challenge and had a second go at the sketch from Freshly Made Sketches. 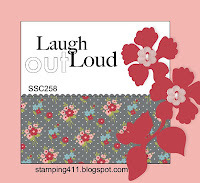 This also meets the criteria for this week's Stampin' Royalty challenge, which is to go masculine. 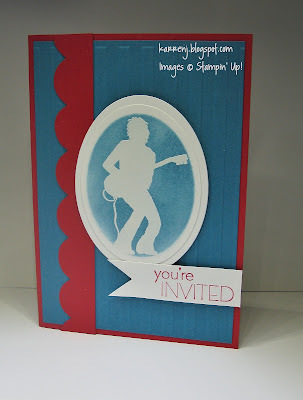 For the card, I embossed the guitarist in white EP on Whisper White cardstock. 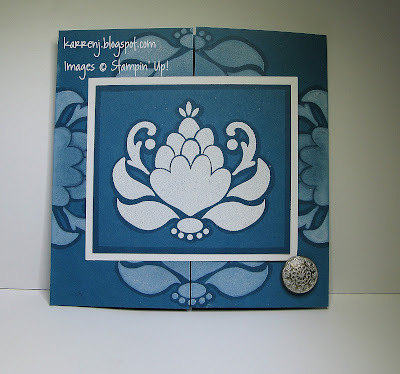 I then cut him out with an oval nestie and while the die cut was still in the nestie, I sponged some Island Indigo ink. BTW, this took me four attempts because the nestie kept moving. I think because my cutting pad on my Big Shot is so warped, it's actually warped the nestie, so it wouldn't sit nicely on the cardstock. Time for new cutting plates, methinks! 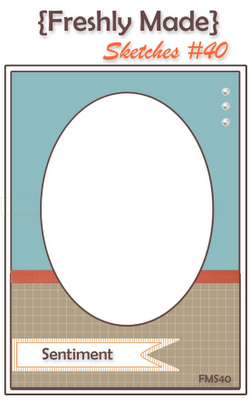 Anyway, once I finally got that sorted, I layered onto another Whisper White oval. The rest of the card is pretty self-explanatory. The theme over at SUO Challenges this week is bright summer days, which is appealing as it's officially the second day of winter where I am. Having said that, we have a lovely sunny day today, so I can't complain! 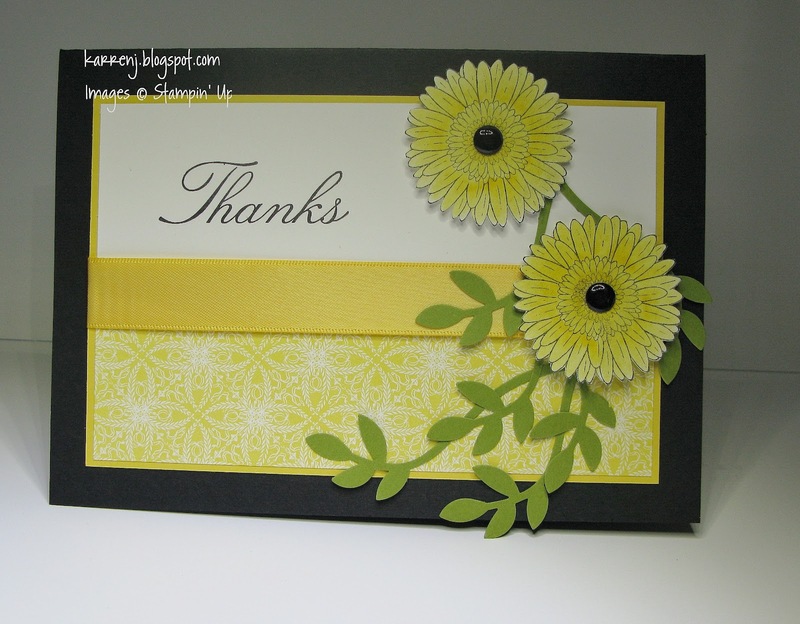 I used a retired set called Hello Blossoms, which I had to mount before I could use (hangs head in shame...). I had to flip the sketch on its side to fit the stamped image. 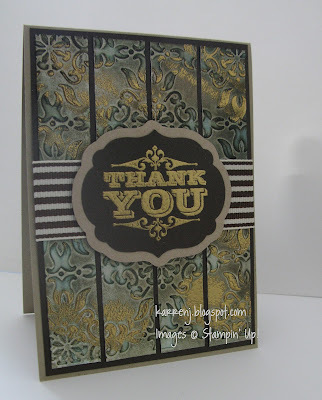 All of the stamping on this card was done using markers. 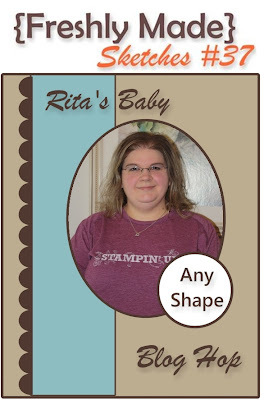 Thanks for looking and all the very best to Rita for her upcoming adventure.